British authorities have confirmed an explosion at Parsons Green underground station was an act of terrorism and that 22 people have been injured. Armed police rushed to an incident on Friday morning after reports of an explosion on a packed rush-hour commuter train. Police say the device did not fully detonate, according to Sky News. Police said "a number of people" have been injured and St Mary's Hospital in Paddington has declared a major incident. London Ambulance Service said none of the injuries are serious or life threatening. The Metropolitan Police tweeted: “The Met’s Counter Terrorism Command are investigating as Parsons Green tube station is declared a terrorist incident. “Too early to confirm cause of fire - now subject to the investigation that is underway. Prime Minister Theresa May chaired a Cabinet Office Briefing Room (COBRA) meeting at 1pm local time. London Mayor Sadiq Khan confirmed the Met Police are treating the train explosion as terrorism. “Our city utterly condemns the hideous individuals who attempt to use terror to harm us and destroy our way of life,” he tweeted. Khan said Londoners will see more police on the streets of the British capital after an explosion at a metro station, which officers said was a "terrorist incident." "They will see over the course of today and the next few days an enhanced police presence, not simply on the public transport network but also across London," Khan told LBC Radio. Commuters reported the explosion stemmed from a fire in a bucket, although the contents of the bucket are not known. 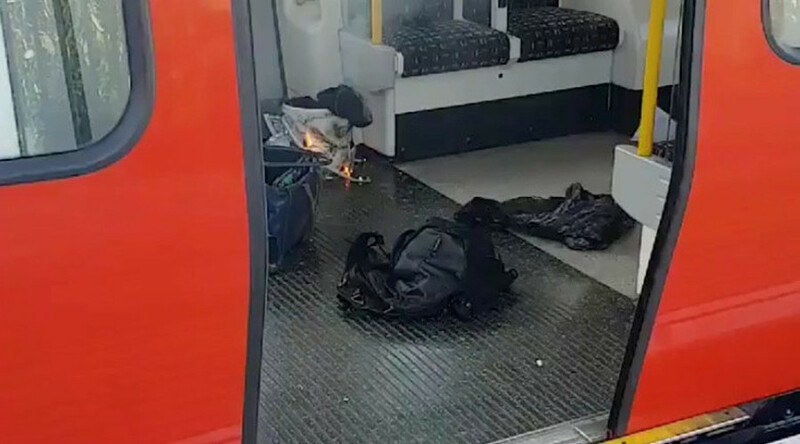 Images and videos circulating on social media show what appears to be a burning bucket inside a shopping bag on the floor of the train.